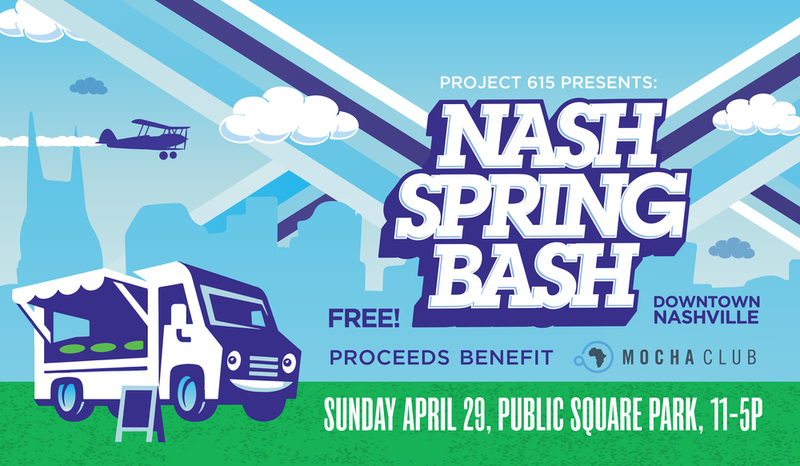 Project 615's 4th annual Nash Spring Bash is a festival celebrating all things Nashville. It's a FREE and family-friendly event that is open to the public where you can enjoy music, your favorite food trucks and over 50 local business vendors. Project 615 is a philanthropic apparel company benefiting the city of Nashville and beyond. Proceeds of this event benefit the work of a local non-profit. Bao Down • Bahn Mi & Roll Factory • Blue Monkey Shaved Ice • Bradley's Creamery • Califarmia • Cousins maine lobster • Daddy's Dogs • Frisson Soft Serve • Grilled Cheeserie • Itty Bitty Donuts • King of Pops • Little Cancun on the Go • The Mac Attack Food Truck • rita's ice truck • Roscoe's Smoked Bar-B-Que • The Juice Bar • Yayo's O.M.G. Plus Austin & Colin "Welcome to Nashville" will be joining us as the official Emcees of Nash Spring Bash! Event Parking @ Premier Parking Public Square Garage. Entrance at 350 Deaderick Street.